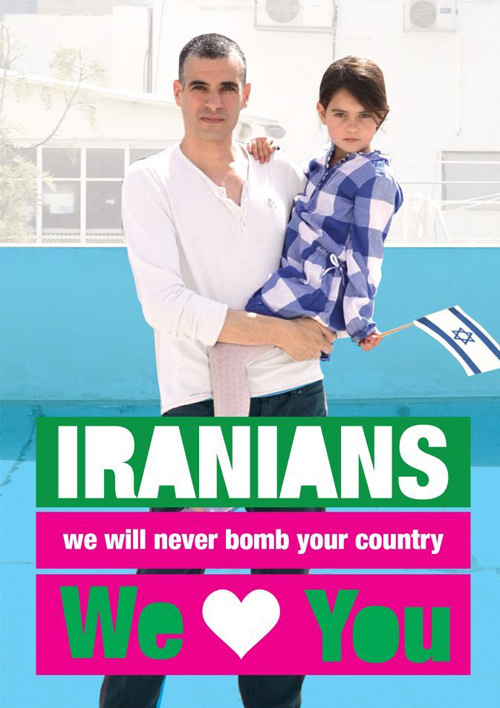 In March 2012, amidst the strained Israel-Iran relations, Ronny Edry and his wife Michal Tamir—graphic designers and educators based in Tel Aviv—posted an image on Facebook featuring a photograph of Ronny and his daughter, along with the caption: “Iranians, we will never bomb your country. We ❤ you.” The image went viral instantly, with many people from Israel posting their own images with the same message. In 24 hours, reciprocating messages from Iran started pouring in. The photo posts acted as a catalyst for conversations between people from two countries on the brink of war. In the following week, Ronny created the Facebook page Israel-Loves-Iran, which thousands of shares, comments and likes, turned into a viral peace movement. Ronny Edry, co-founder says, “Once you see your enemy as a human being similar to yourself, being expressing his love and understand he doesn’t hate you as years of propaganda succeed to make you believe, you can never go back to blind hate, then you can start to know each other and you will be ready for peace.” Here’s a TED talk with Ronny Edry talking about how one image started an entire movement. In terms of visual communication for change, the Israel-Loves-Iran project is significant on two counts. Firstly, on the creation of a simple but evocative communication framework, that can be used by anybody to create their own piece. Secondly, the use of portraits—every day people, spontaneously shot in their environments—provides a real human connection, to override the hate propaganda. Such is the power of images. With the success of the Facebook page, Ronny and Michal went on to start Peace Factory—a non political organisation promoting peace in the Middle East by re-humanising the way in which people from “the other side” are perceived—using communication and media creatively.